The past couple of weeks have been extremely stressful for me. It just seemed like one thing after another came up on the heels of the last one and it didn't seem to be ending anytime soon. I'm not one to aim to avoid stress, it can actually be a very good thing for me, but it was just building up so much that I was definitely wishing it away. 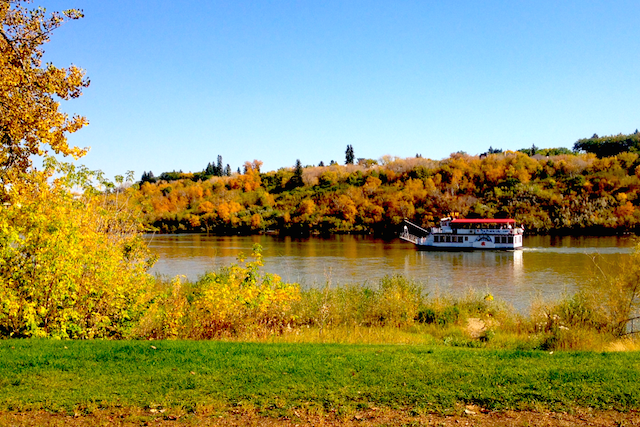 I was downtown yesterday afternoon for an interview and afterwards I got myself a cup of coffee and let myself just enjoy the extremely beautiful fall (but more like summer) weather that Saskatoon has been experiencing lately. I wandered down to the river and sat down on a bench, taking in the sunshine mixed with the crunchy yellow and red leaves. I breathed in, I breathed out. I remembered just how blessed I am to live in such a beautiful city, and to have the opportunities I have. Maybe I have been stressed, but everything was still working out. The interview I had just been at went really well, I had the afternoon to do as I pleased, I ran into an old colleague on my way to the river, and I knew exactly what I needed to do to make a stressful situation a whole lot better very soon. I left the river feeling so much better, and ready to jump right back in to everything going on in my life right now. Sometimes you simply need to change your perspective and everything will turn out just fine.